"An IF is a finding concerning an individual research participant that has potential health or reproductive importance and is discovered in the course of conducting research but is beyond the aims of the research. This means that IFs may be on variables not directly under study and may not be anticipated in the research protocol." Incidental findings in research are becoming increasingly common due to the advances in imaging and genetics research. 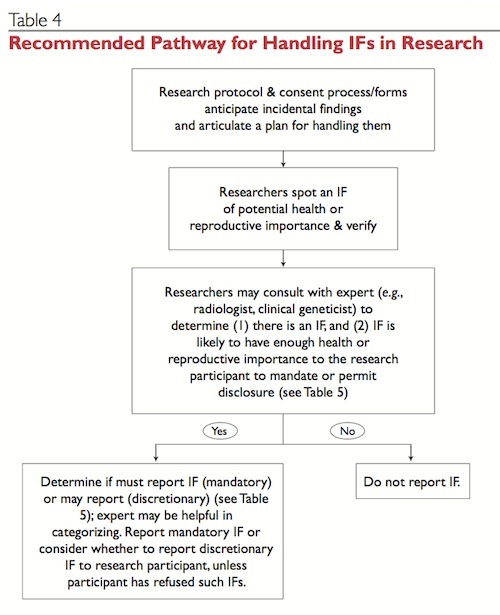 Investigators must consider the possibility of IFs as part of their assessment of the risks and benefits of research participation and must have a plan for reporting results. Discovery that a subject may be suicidal from the results of a quality of life survey (for more on suicidality see the Behavioral Research page. Which results are clinically significant? this means that the test was performed in a laboratory with established procedures to ensure reproducibility. In keeping with CHOP clinical guidelines, IRB SOP 903: Reporting Test Results and Incidental Findings interprets this to mean performed in a CLIA-certified lab. However, the FDA reported on July 31, 2014 that they were issuing "a final guidance on the development, review and approval or clearance of companion diagnostics, which are tests used to identify patients who will benefit from or be harmed by treatment with a certain drug" and they were intending "to publish a proposed risk-based oversight framework for laboratory developed tests (LDTs), which are designed, manufactured and used within a single laboratory going to end its enforcement discretion related to lab-developed tests." This latter action could especially impact the use of genetic tests. which means that there are important implications to the participant's health and well-being which justify the risks of anxiety and concern that will be raised by knowing the results. This requires that there are effective preventive measures, treatments or interventions currently available. What are the investigator's obligations? A plan for identifying and assessing which IF are of likely clinical significance. Since IF may be outside the investigator's expertise, this could include a plan for obtain clinical expertise from non-investigators. Identify which results will be reported to subjects and the circumstances of the communications (who, when, where and what). This involves deciding which results are of known clinical significance and utility and this may change over the course of the research. Develop a plan for further care. This could include provision of care by the investigator, referral to another clinic, physician or provider or information about alternative resources for obtaining care. Inclusion of "any foreseeable risks" and "any benefits" that derive from reporting IF as required by regulation. IF that have uncertain clinical implications and where there are no known treatments or interventions may cause subjects undue concern, anxiety and worry. IF that identify a major health problem, could be of tremendous benefit. Inclusion of an opt-out from knowing the results of research tests. All clinically significant research results must be recorded in the CHOP Medical Record. Refer to the CHOP Research Institute Policies to determine which results must go in the medical record. (a) "the findings are scientfically valid and confirmed"
(c) "a course of action to ameliorate or treat these concerns is readily available." "When the risks identified in the study are both valid and associated with a proven intervention for risk reduction, disclosure may be appropriate." a. The genetic finding has important health implications for the participant, and the associated risks are established and substantial. b. The genetic finding is actionable, that is, there are estab- lished therapeutic or preventive interventions or other available actions that have the potential to change the clinical course of the disease. c. The test is analytically valid, and the disclosure plan complies with all applicable laws. Note: Genetic test results should not be reported to study participants and their physicians as clinically valid tests unless the test(s) was performed in a CLIA certified laboratory. CHOP Pathology Policy does not permit the return of lab tests performed in non-CLIA-certified labs; such results should be used for research purposes only. d. During the informed consent process or subsequently, the study participant has opted to receive his or her individual genetic results." "Recommendation 2: A researcher’s obligation to return individual research results to a study participant should not ordinarily extend beyond study funding. Even in the case where investigators have access to alternate funds, investigators may, but should not be expected to, return results beyond the termination of research funding." "Recommendation 3: For consistency and rigor, an independent, national central advisory committee should be established to review evidence for genetic risk factors to offer guidance to investigators, research institutions, and IRBs regarding when a genetic result is well enough understood and has sufficiently serious clinical implications to justify an obligation to return genetic research results to study participants." In human embryonic stem cell research, the duty to report individual research results "depends in large part on the reliability of the findings and the significance of the information to human health." "CLIA regulations do not permit the return of research results to patients or subjects if the test were not conducted in a CLIA-approved laboratory." Upon their request, "[r]esearch participants should have access to experimental research data except when...[t]he reserach results are of unproven clinical validity, and the IRB has judged that there is no benefit to the research subjects."